Grave / Reference: Panel 10.F. Relatives: Son of Harry and Mrs Mary Mann. Address: 35 Angel Street, Hadleigh. 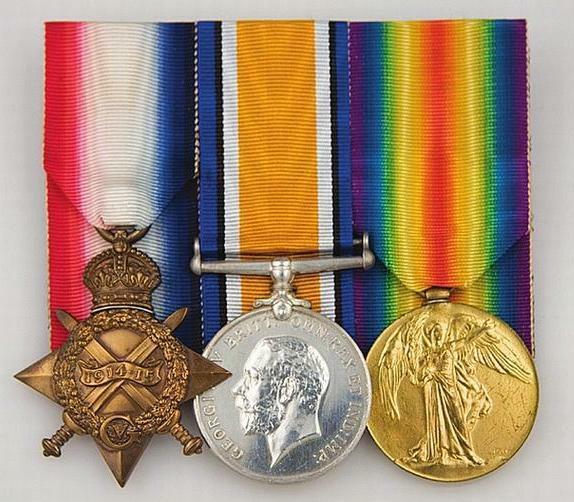 Private Grimwood was entitled to the above three medals; 1914 Star, British War Medal and the British Victory Medal. The whereabouts of Private Grimwood's actual medals is currently unknown. 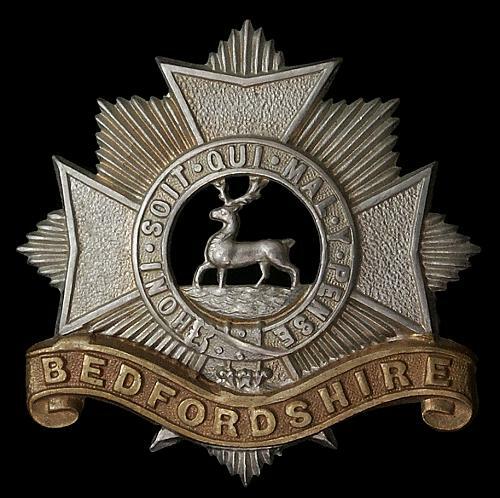 ONE OF THE FIRST TO FALL - Private William Grimwood's battalion, the 1st Bedfordshire Regiment were part of the 15th Brigade, 5th Division, II Corps. They immediately deployed to France with the British Expeditionary Force on the outbreak of war and took part in all the initial engagements. Going by his regimental number 8168, Pte William Grimwood joined the Bedford regiment in early 1905 (Number 8193 was issued on 27 Jan 1905). The 1st battalion left India in 1907 arriving in England, via Aden, the following year. In 1911 they and William were at Aldershot and in 1913 they were posted to Mullingar in Ireland. At the out break of war they sailed from Belfast to La Havre landing in France on the 14 August 1914. They were part of 15th Brigade in the 5th Division. They fought at Le Cateau, on the Marne and Aisne and were involved in the 1st Battle of Ypres. On the 12th Oct 1914 they had arrived in the La Bassee area and were about to take part in the battle of that name. They occupied the village of Givency against light opposition. However, the next day the Germans strongly countered attacked and after heavy fighting the Bedfords were forced to retire to just outside the village. Their losses were 7 officers and 140 men. The 1st Devons who had recently joined the 5th Division fought on their right flank throughout the battle. Deploying with the BEF in August 1914 would make William entitled to the 1914 Star, sometimes known as the ‘Mons’ Star. This was proudly worn by the survivors of the BEF who also dubbed themselves the ‘Old Contemptibles’ a name that they were supposedly first called by the Kaiser who labelled the stubborn force that stood in his way as that “contemptible little Army”. The men of the Indian Corps began burying their fallen comrades at this site in November 1914 and the cemetery was used continually by field ambulances and fighting units until the German spring offensive began in March 1918. Richebourg L’Avoue was overrun by the German forces in April 1918, but the cemetery was used again in September and October after this territory was recaptured by the Allies. Today over 900 Commonwealth servicemen who were killed during the First World War are buried here. We hope that this page has been able to tell the story of William Grimwood. If you know of any information which might help to add to the story then please get in touch.